But that's okay. In a world of bad news, fake news, delays, disappointments, trash talk, and tweets, things are bound to get a little poopy. What matters is not how big the mess is--but how well you react to it. 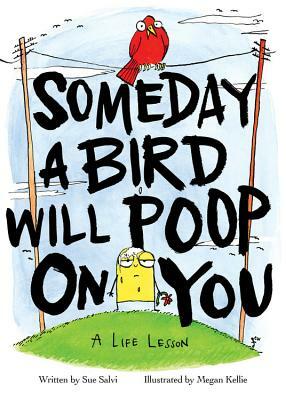 Someday a Bird Will Poop on You is a modern parable about life hitting us with something unexpected--and the perfect gift for anyone leaving home without an umbrella. Sue Salvi is an actor, artist, and writer who lives in Chicago. She performs regularly in Chicago at the Second City, at the iO Theater, and at other reputable/non-offensive establishments. Megan Kellie is a writer, actor, artist, and other who lives in major American cities, this time Chicago. She has written for NPR, the Paper Machete, and Proper Noun.